Swarovski’s Pure Brilliance Cuts for Zirconia are truly cuts above the rest – the exact symmetry and proportions of the cuts maximize brilliance and make Swarovski Zirconia the finest and most diamondlike Zirconia available on the market. 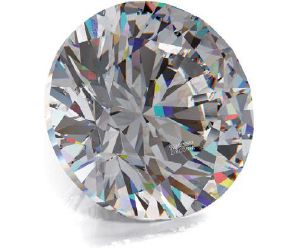 The Round Pure Brilliance Cut is the first Zirconia in history to adhere flawlessly to the comprehensive set of standards for grading diamond cut quality of the Gemological Institute of America (GIA), the world’s foremost authority on diamond-grading. Swarovski Pure Brilliance Zirconia is available in various colors and cuts. Every single Pure Brilliance Zirconia is marked with a microscopic engraving that is completely invisible to the naked eye. The laser-engraved quality seal serves as your assurance that you are acquiring stones of highest precision and brilliance meeting the cutting standards of the high-quality diamond industry. Swarovski offers a unique Zirconia selection. Each stone is crafted to meet the most stringent criteria of quality, size, shape and cut using the most sophisticated technology based on Swarovski’s special cutting know-how. The result: a brilliance and quality unrivalled in the industry. SWAROVSKI ZIRCONIA are cut and polished in Swarovski’s own factories maintaining strictest social and environmental standards. The use of the special “Made with SWAROVSKI ZIRCONIA” tag is a strong symbol of identification for the products of Swarovski partners, enhancing their value and providing assurance that you are buying only the finest Zirconia quality.